Estimates are for illustration purposes only and may or may not reflect actual repair costs. Vehicles are often driven between 15,000 and 20,000 miles per year. 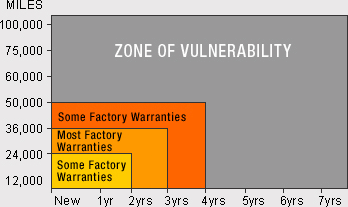 In this amount of time, your vehicle may be out of manufacturer's warranty in less than 2 years. Don't let your vehicle go unprotected in the years and miles thereafter!